Sorry... the 2017 Volkswagen Golf R is no longer being sold as new. Instead, take the first step to a great deal on 2018 Volkswagen Golf R with a free price quote! 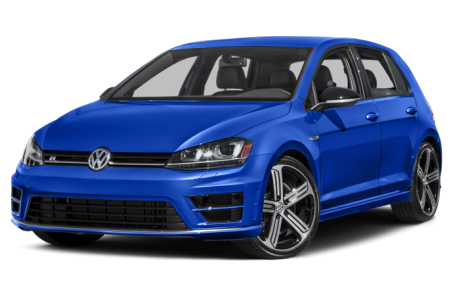 The 2017 Volkswagen Golf R is the high-performance version of the regular Golf hatchback. It competes with the Ford Focus RS, Subaru WRX STi, and MINI Clubman. Two trims are available: the 4-Door base model and 4-Door with DCC and Navigation. Overall, the Golf R is sporty without being overly aggressive. The front-end features long, clean lines that stretch across the grille and segmented lower fascia. The rear-end is styled just as subtly as the regular Golf, but upon closer inspection, the quad exhaust tips allude to its punchier nature. Standard features include Xenon HID headlights, LED daytime running lamps, a dual-pipe exhaust system, and 18-inch alloy wheels. Adaptive suspension and larger 19-inch alloy wheels are available as well. Under the hood, the Golf R is powered by a standard 292-hp, turbocharged 2.0-liter 4-cylinder engine mated to a 6-speed manual transmission or a 6-speed dual-clutch automatic and 4Motion all-wheel drive (AWD). Inside, the Golf R has a uniquely sporty interior with leather seating and carbon fiber-style inlay. It still has 52.7 cubic feet of cargo room with the rear 60/40-split seat folded down. The center stack features the standard MIB II infotainment system that includes a 6.5-inch touchscreen, Bluetooth connectivity for phone and audio, and a USB port. It can be upgraded with an integrated navigation system, Dynamic Chassis Control, and a Fender premium audio system. Dynamic Chassis Control (DCC) allows the driver to switch to three different driving modes: Normal, Sport, and Comfort via the touchscreen. A leather-wrapped steering wheel and sport pedals come standard. The Golf R now comes with standard driver assistance features include adaptive cruise control, forward collision warning, autonomous emergency braking, a blindspot monitoring system, rear cross-traffic alert, and lane departure warning. A backup camera and a post-collision braking system also come standard.